Microsoft has made another somewhat dubious move in its bid to get Windows 7 and Windows 8.1 users to accept the offer of a free upgrade to Windows 10. This time, it involves tweaking the pop-up 'Get Windows 10' box to make it more likely that some users might simply click through and take on the upgrade anyway. This is the box which has been popping up more regularly on our PC – seemingly every couple of days – for the last few weeks, another change that Microsoft made (previously it just sat in the taskbar with only the very occasional pop-up reminder appearing on the desktop). InfoWorld spotted the new tweaked pop-up, which urges users to upgrade to Windows 10 as ever, but now has two buttons: 'Upgrade Now' or 'Upgrade Tonight'. In other words, whichever option you click on, you're going to be on the path to upgrading – and it looks like there's a choice here, when really there isn't. This means that careless folks, or the less tech savvy, may end up choosing one of these two options because they didn't read the text properly, or they failed to realise the only way of closing the box is by clicking on the red 'x' top-right. This is the kind of underhand tactic often adopted by spammers, and once again, it doesn't leave a good taste in the mouth regarding Microsoft's pushing of the Windows 10 upgrade, which is becoming more and more heavy-handed. And the more forceful Redmond gets, the more desperate the company looks, frankly. It would seem that this box is only appearing in certain territories, though, as our 'Get Windows 10' dialog merely has the one option: 'Upgrade Now'. That said, there's still no 'Don't upgrade and don't bother me again' option, and the only way out is to click the red 'x' to close the window. 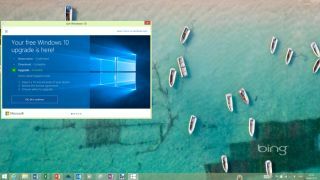 Recently, we also heard about Microsoft foiling third-party software which blocks the Windows 10 upgrade pop-up reportedly by using sneaky little undocumented tweaks. Again, this does the company's image no favours, and neither does the decision to push the new OS as a recommended update at some point early next year.